Canada Wildginger. Asarum canadense L.
Asarum, Indian ginger, Canada snakeroot, Vermont snakeroot, heart snakeroot, southern snakeroot, black snakeroot, coltsfoot snakeroot, black snakeweed, broad-leaved asarabacca, false coltsfoot, colicroot. This inconspicuous little plant frequents rich woods or rich soil along roadsides from Canada south to North Carolina and Kansas. Canada wildginger, better known perhaps as Canada snakeroot, is a small plant, apparently stemless, and not more than 6 to 12 inches in height. 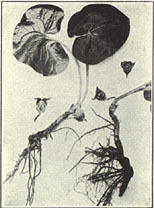 It usually has but two leaves, which are borne on slender, finely hairy stems. The leaves are kidney-shaped or heart-shaped, thin, dark green above and paler green on the lower surface, and from 4 to 7 inches broad. The solitary flower is borne on a short, slender stalk produced between the two leaf stems, and on account of its closeness to the ground it is not readily noticeable. It is bellshaped and of a dull-brown or brownish-purple color, the inside being darker than the outside. The plant has a creeping, yellowish rootstock with thin rootless produced from joints which occur about every inch. It has a fragrant odor and spicy taste. prev: Button-Snakeroot. Eryngium aquaticum L.
next: Carolina-Jessamine. Gelsemium sempervirens (L.) Ait. f.